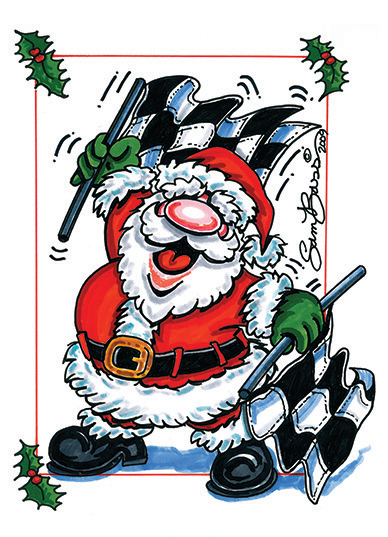 Holiday Card Sets Designed By Sam Bass The NASCAR Foundation partnered with Sam Bass Gallery to produce one of a kind Holiday Cards with your favorite Speediatrics characters such as Safety Sam, Chase, Lou Chief and Champ! To say that Sam loves the holidays is an understatement. For years, 'The First Officially Licensed Artist of NASCAR', has had a tradition of creating cheerful winter-themed originals depicting Santas and snowmen in whimsical snowy settings. Although this tradition was originally started for close family and friends in celebration of Sam’s favorite season, the warm characters and chilly scenes caught on. They became so popular that in 2005 - after encouragement from those same family members, friends, and clients - he released his first edition of the Sam Bass Santas & Snowmen Collection. Now you can have a set of these specially designed cards to send to your friends while helping us continue our work of helping children in our racing communities. NASCAR. Since 1987, he has created race team graphics for corporate America’s leading sponsors, NASCAR team owners and drivers. He is also known for his fine-art original paintings and a distinctive style when it comes to his design of track program covers, racing-themed ad campaigns, posters, apparel and custom-shop guitars. His personal studio and motorsports art gallery in Concord, N.C., are adjacent to Charlotte Motor Speedway. He is the first officially licensed artist of NASCAR. For more information, please call (704) 455-6915, or log on to www.sambass.com. of these limited edition Holiday Cards.